CryoRFID™, deep freeze thermal transfer radio frequency identification (RFID) labels can be scanned/read from any direction, emitting a signal in a 360º radius, able to traverse solid objects, making them readable even when not in your direct line of sight. 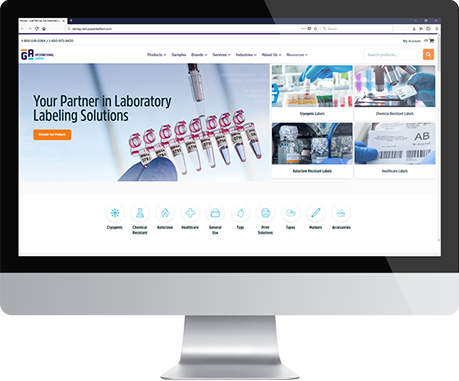 This enables you to scan your samples without having to remove them from their storage container, or even the freezer, cutting down on search time and helping to preserve their integrity. CryoRFID™ labels have a flexible ultra-high frequency (UHF) inlay that allows the label to conform to almost any surface and a deep-freeze adhesive (suitable for -80ºC freezer storage and dry ice transport that allows excellent adhesion to vials and other containers, even at very low temperatures. Suitable for small diameter microtubes & cryovials, cardboard freezer boxes, polypropylene cryo/freezer boxes, cell culture plates, plastic bags and other containers. Apply the labels at room temperature, on a clean surface for optimal results. The EPC memory is provided in a rewritable, open format, though a password can be attached by the user for added security. These freezer-grade RFID labels are waterproof, sturdy and weatherproof, adhere to wet and damp surfaces, able to resist spraying with chemicals and detergents, including ethanol, isopropanol as well as other alcohols, bleach and DMSO (additional testing recommended). CryoRFID™ are also grease-proof, well suited for outdoor applications such as labelling plants, flowers, gas and oil production equipment, and more. They can be printed with our RR or XAR category of ribbons, and are available on 1” and 3” cores. They are compatible with all major commercially available barcode thermal transfer printers such as Zebra, Datamax O’Neil, Sato, CAB, Intermec, Monarch/Paxar, CognitiveTPG, Printronix, Brady (selected models) and more. When using the ALH-9001 Alien Reader at max output theCryoRFID™ labels have a 304.8 mm read range. Read range must be determined by end user based on model of reader/scanner used.